This one was published in the venerable Macon Telegraph, so it really has to be true. (For real, see the article). It seems that the Pork Board, ummh make that the National Pork Board, has decided that it’s time to change their careworn slogan of 25 years. You’ve heard the old tagline, even if you don’t remember it: “Pork: the other white meat.” That one never really played well down here. The first white meat is naturally chicken. In Middle Georgia, we always figured the other white meat was catfish. So, anyway, with pork consumption totaling 50 pounds per capita in the U.S.; the National Pork Board wants to increase consumption by 10% by 2014. And they’re going to do it with “a stronger connection, a more emotional connection to our product,” This according to Ceci Snyder, the board’s VP of Marketing. Tying all of this together is a new and powerful new slogan. Are you ready for this? 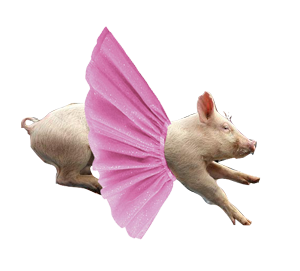 The pig in a tutu doesn’t come with the new catchphrase . . . it’s Poor Richard’s contribution, just for effect. I don’t know about the rest of you, but this one really gets my adrenaline pumping. I’m picturing a big budget, highly paid advertising executives, focus groups, quantitative analysis, A-level meetings with upper management, large expenditures, lots of money . . . all surrounding the impressive new phrase: Be inspired. Oh, and did I mention lots of money? Poor Richard used to travel through southern Indiana, where they talk about hogs and actually raise them. I expect that a small agency in Vincennes or Seymour could have done the same work for $500. Nonetheless, I am impressed (and inspired). In fact, I’m so inspired that I’m going to start on this year’s 55 pounds of pork tomorrow. Barbecue for lunch at Gralpharaphics! You are currently browsing the Poor Richard's Printshop blog archives for March, 2011.